But before things got extremely Cleveland, they were very un-Cleveland, as new QB Tyrod Taylor led the team on a fourth-quarter comeback from a 21-7 deficit, culminating with a fantastic catch from Josh Gordon with two minutes to play in regulation. The teams stalemated in the extra period, but it wasn’t for lack of trying. After trading some punts back and forth, the Steelers had a shot at the win with a 42-yard Chris Boswell field goal. He missed. The Browns punted on their next possession, too, but gained new life with under a minute to go when Joe Schobert picked off Ben Roethlisberger, returning it to the Steelers’ 14 only to have the play called back by 10 yards due to an illegal block penalty. The Browns still had a chance to win, but those 10 yards may have been crucial. 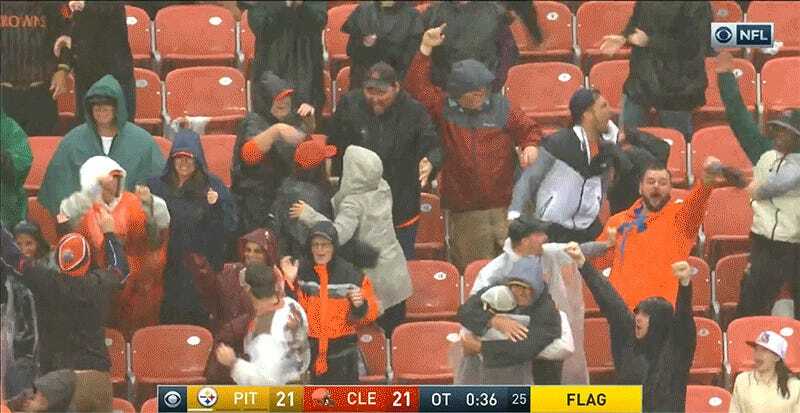 Zane Gonzalez’s 43-yard game-winning field goal attempt was blocked, ending the game in a tie and guaranteeing that the Browns cannot go worse than 0-15-1 in the 2018 season. I wonder how Buffalo feels about giving the Browns their best quarterback.